Our days can get so busy that sometimes we need a little something to help us make it through the afternoon. Between work, hitting the gym, and taking care of kids, a home, pets, and everything in between, when our energy hits the skids it can seem almost impossible not to grab a bag of chips from the vending machine. But what if you had a healthy homemade treat on standby, one that helps you steer clear of junky vending machine fare? 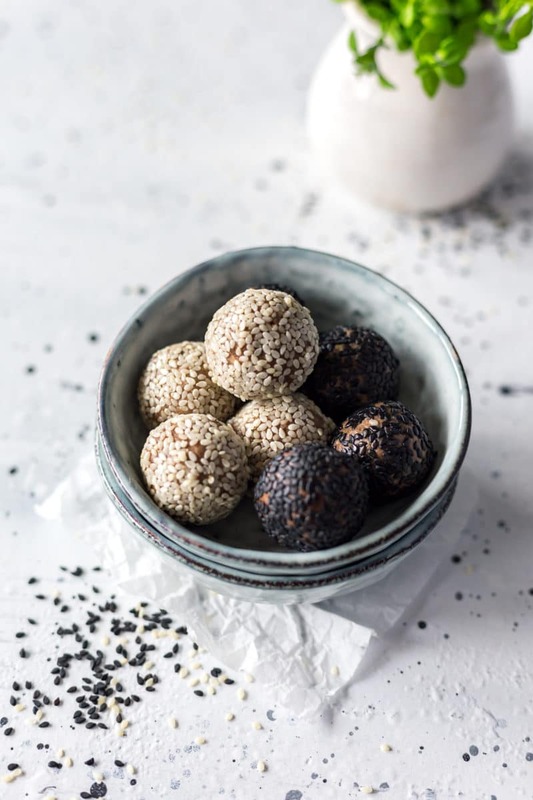 Make up a quick batch of these chocolate tahini protein energy balls and you’ll feel happily fueled. Plus, you’ll avoid the stomachache and guilt that can follow a vending machine visit. While you may feel satiated briefly by that bag of empty calories, the hit it gives your blood sugar will just as quickly leave you feeling as you were before: tired, cranky, and hungry. Those feelings usually lead to another trip to the vending machine, in the hopes that something else – maybe a candy bar? – will do the trick. But it won’t. Instead, you’ll just end up taking in more empty calories, and you’ll be longing for feeling that good kind of full. You know, the feeling you get when you’re fueling your body on healthy food, like that time you savored an almond butter cup vegan protein smoothie. Something that tastes naughty, but is oh-so-nice instead. 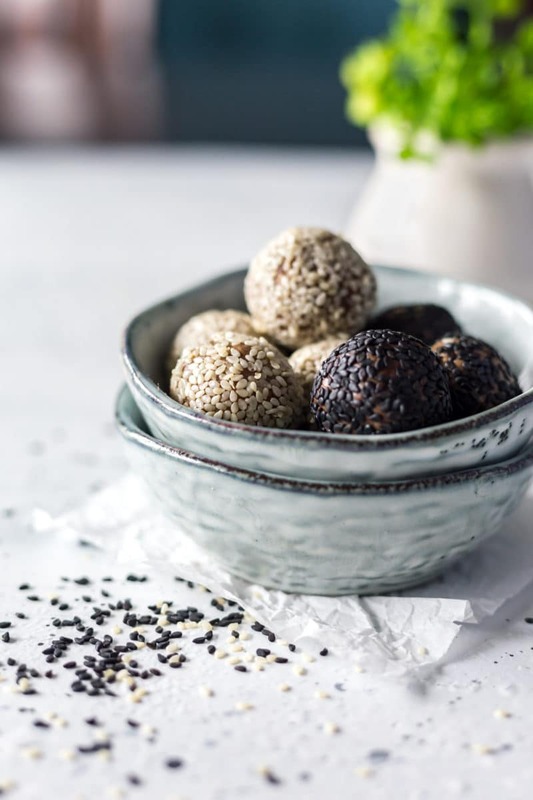 These protein energy balls will definitely give you that feeling. And they are perfect for the on-the-go lifestyle. 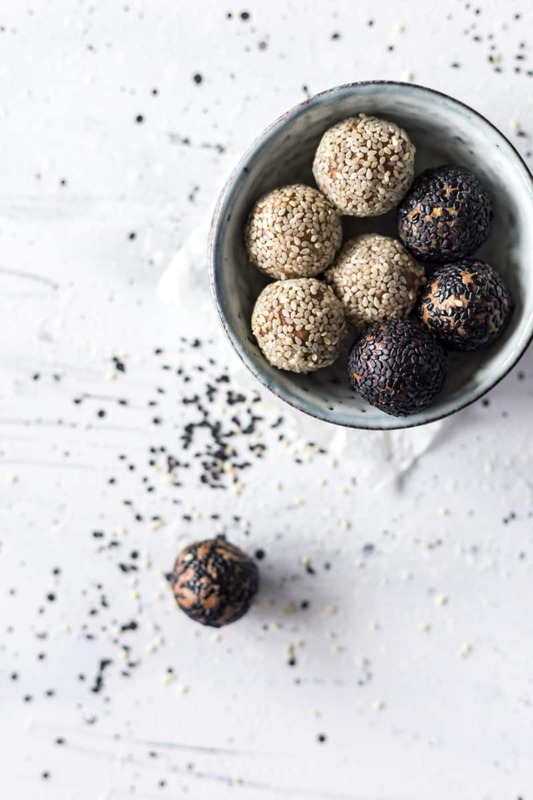 Naturally sweet with Medjool dates, these pop-in-your-mouth bites can be saved in a baggy or small container in a purse or desk drawer for easy access. 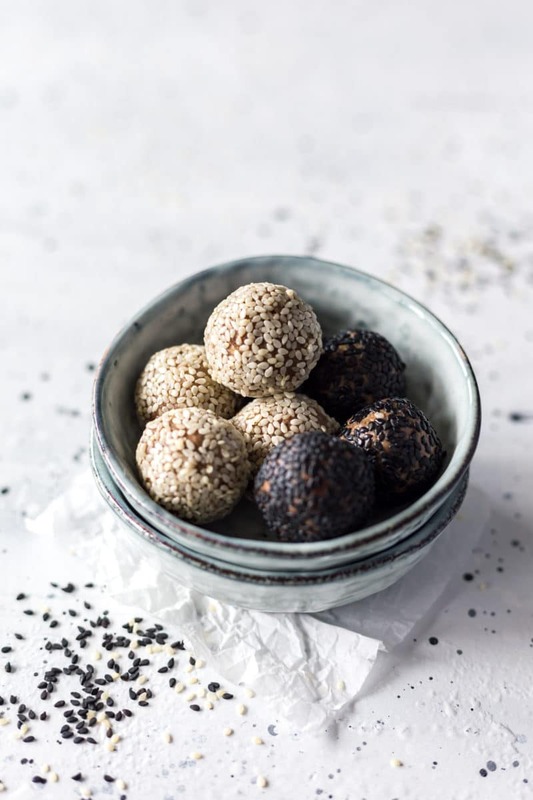 For flavor and a punch of protein, we used a plant-based, vegan chocolate protein powder, so these little balls of energy are sure to keep you going when you reach that mid-afternoon slump. If you’re wondering why you should bother making these when you are just a couple button-pushes away from instant gratification, you have to remember these are no bake. As in, ready to eat in five minutes. Sooooooooooo easy. Plus, they keep well in an airtight container for several days, stored at room temp. So why deprive yourself of tasty goodness? 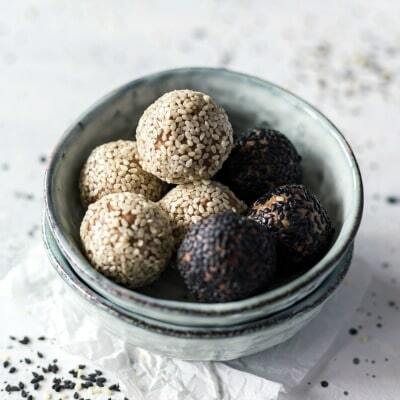 Power up your day with these chocolate tahini protein energy balls! 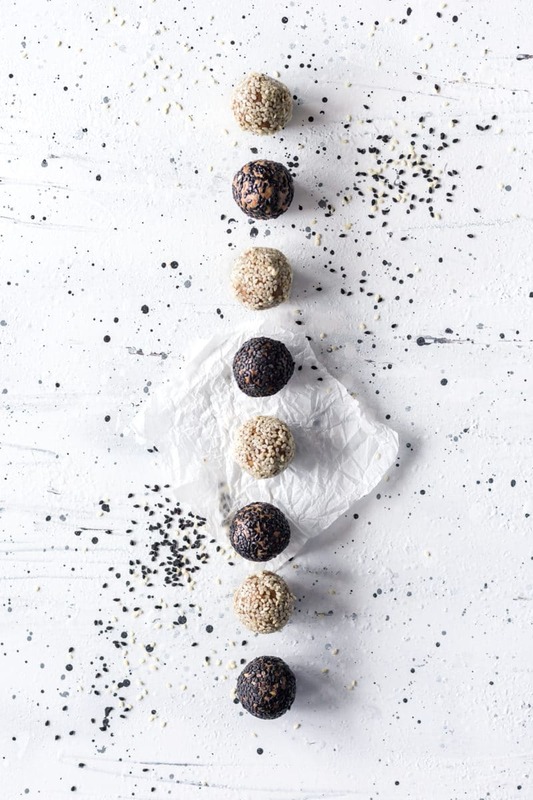 These pop-in-your-mouth Chocolate Tahini No Bake Energy Balls are perfect for life on-the-go. Skip the vending machine junk food and make a batch of these instead. Add the dates to a small food processor and pulse until a sticky paste forms. Add the protein powder, tahini, rolled oats, and vanilla extract and continue to pulse the food processor until a crumbly mixture forms. Roll into 8 balls and coat with sesame seeds (about 1 tsp/ball), if desired. Store these in an airtight container outside the refrigerator (at room temperature) for several days. Otherwise, they can dry out and become crumbly. Following a plant-based, low-sugar diet doesn’t mean you have to deprive yourself of sweet treats. In fact, it’s just the opposite: eating gluten- and dairy-free desserts can make your tastebuds happy – and leave you feeling energized afterwards, unlike heavy traditional recipes. Not convinced? Download my Healthy Desserts eBook and see for yourself. Get 8 irresistibly delicious recipes – for FREE! – right now by clicking the banner below!